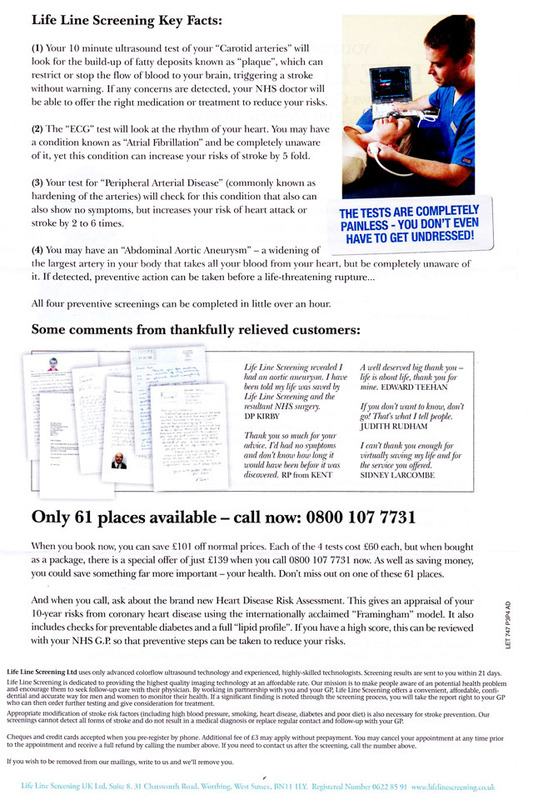 As in The Sun newspaper, the bold text spells out the key messages so you don’t even have to read the rest: prevent a stroke, no prior symptoms, can’t get tested on the NHS, 61 places available, to book call 0800 etc. 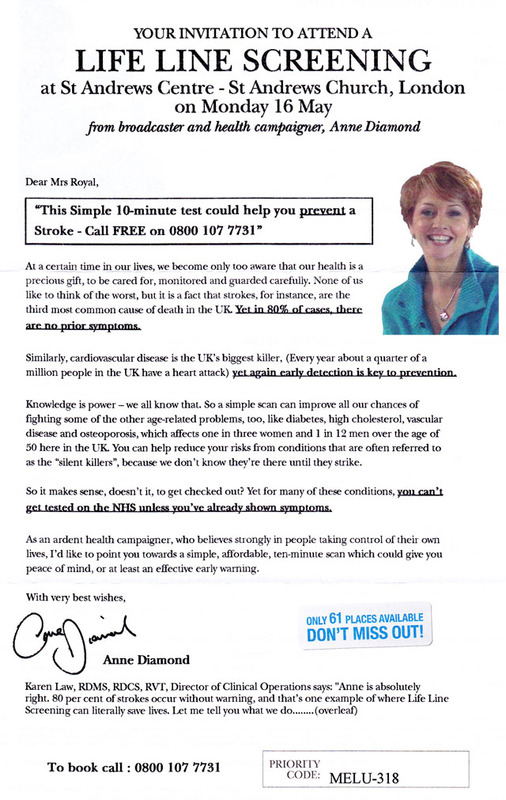 .. and again, the point’s very clear: should they take the tests, the recipient might find “fatty deposits … which can restrict or stop the flow of blood to your brain, triggering a stroke without warning”, or a condition of which they may be “completely unaware” that “can increase your risk of stroke 5 fold”, or another that “increases your risk of heart attack or stroke by 2 to 6 times”*, or even another that could cause a “life-threatening rupture”. The second leaflet even refers to “silent killers”. Which is all quite scary. And that’s probably the point. But does anyone really need to fork out £139 for the tests? I have no idea. I’m no more a medical doctor than Anne Diamond is, so I’m probably not the best person to judge whether or not this kind of screening could be beneficial. “For a screening test to be worthwhile, it has to meet several criteria. You want to know the predictive value of a positive test in the population being screened. You want to know not just whether it picks up an abnormality, but whether picking up that abnormality will allow earlier treatment that will make a difference in outcome. You want to know whether false positive tests will lead to harmful invasive procedures. Bottom line: does the test do more good than harm? And so, armed with this information, we’ll be conducting our own little screening process by which any further letters from Life Line get dumped straight in the recycling. Were I, for example, my grandmother, though, I wonder if I’d be reaching for my chequebook (cheques are accepted, and the leaflet reassures: “our screenings are designed for those aged 50 and older … you don’t need to remove any clothing, other than your shoes and socks”). And as for Anne Diamond, I await her opinions on other areas in which she has a valuable insight, such as for example reviewing Halo 3 and Resident Evil 4. No, wait. Something else. There must be something. * I do have to wonder: if I had both conditions, would my risk increase by between 10 to 30 times?